Nympheas or Water Lilies is a series of paintings by Claude Monet that he painted from late 1800s to 1920s. Monet painted his Japanese flower garden from his home in Giverny, France where he lived for the last thirty years of his life, into 250 paintings of the series. He was an expressionist and impressionist, the style that he has used at its best in this series. Born in 1840, Monet was well known for his use of color and eye for detail. He has developed a number of long works that include many paintings in a series. He was mostly a painter who painted nature and landscape. He started to paint at a very early age and had always kept his focus on painting nature. As a result, he was soon able to develop his own style, which he perfected over the years, till his death in 1926. What museum is Monet’s water lilies in? How much is water lilies by Claude Monet worth? How many Monet water lily paintings are there? The Water Lilies series is a collection of 250 paintings in which he has painted his Japanese flower garden. Monet had developed this garden using imported water lilies from Japan and had special staff attending to the maintenance of the garden. He also had a small round bridge made from wood in his garden. In this series, he has painted the various parts of his garden in various lights and at different times during the day. 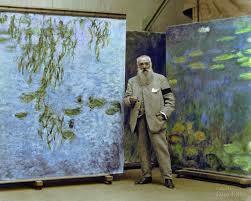 Some of the most famous paintings in this series include Water Lilies (1903), Water Lily Pond (1908), Blue Water Lilies (1916-1919) and Wisteria (1925). The total dimension of the paintings is 78.74 x 502.36 inches. The perfect blend of shades that Monet has achieved with the use of oil paint that almost gives an impression of watercolor is considered the most striking feature of this series by most critics. The main subject of the paintings in the Water Lilies series is the round bridge and water lily flowers in Monet’s garden and pond. The paintings are a landscape but have a dreamy feeling to them which takes them very close to abstract art. He has made extensive use of his skills as a viewer which is reflected by the details that the paintings contain. Besides, the attention that has been paid to details does not highlight one part of the paintings. A common light source from above the paintings throws uniform light on each and every flower and Monet has painted them in the exact manner as they appear to be. The technique that Monet has used in these paintings reflect a lot about his genius as a painter and his personal condition at that time. The water has been panted by mostly using straight and long strokes of the brush. The water lilies, on the other hand, are painted by dabbing color at one point or by round and twisted movements of the brush. There are no specific lines that separate the flowers and the water, which gives the painting a blurry look. Monet might not have been able to develop the lines because of his troubling cataracts at the time when he was working on these paintings, but this look of the paintings have added a lot to the quality and value of this series. The dreaminess that the paintings have makes it a work of almost an abstract nature. Also, the observation for details and the ability of Monet to re-create it over the canvas makes up for the realism in them. The choice of color and composition and the quality of the strokes that have been used by Monet in this series make it an ideal work of impressionism because of its ability to evoke a sense of peace in the viewer. Monet has completely focused on the mood in the painting and has concealed the more minute details from the eye of the viewer which reflects the expressionism in this work. 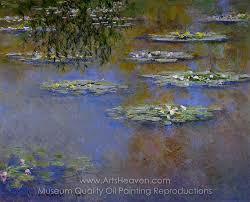 The Musee de l’Orangerie in Paris houses eight paintings among the Water Lilies series of Monet. The others are a part of private collections all over the world along with some famous museums across Japan, New York and many countries of Europe. The various paintings of the Water Lilies series have different worth. One of the paintings in the collection has been recently auctioned at $43 million in New York. Some of the paintings in the series has been sold at a price of up to $81 million. The Water Lilies is a collection of 250 paintings in total.